Het werk van de Hengelose mediakunstenaar is gebaseerd op kinetische, interactieve en tijdgerelateerde processen. Spinhoven combineert wetenschap, technologie en beeldende kunst in zijn geraffineerd multimediaal werk, dat de verbeelding prikkelt en misleidt. The art works of media artist Bill Spinhoven van Oosten are based on kinetic, interactive and time-related processes. Spinhoven van Oosten combines science, technology and visual arts to create sophisticated multimedia works, challenging your imagination. The Logic of Life is an enigmatic and wayward machine, in which the logic of natural movement collapses and the glance loses its bearings. 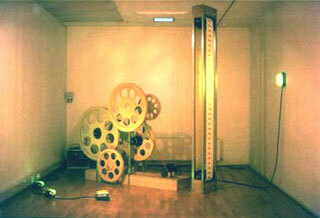 The machine is only lit by LED lamps, which, controlled by a computer, flicker in various frequencies. In this sparse and changeable light, you see a construction which consists of a combination of wheels resembling film reels, in various sizes, and broad belts which connect the wheels and make them turn at high speed. The construction moves like an old-fashioned mechanism, while on the belts - strips of paper - images can be seen of a small hovering figure which makes flying movements. However, there is something amiss in The Logic of Life: the direction of the movement and the speed of the images and wheels change, they are unpredictable, illogical, and inconsistent with the construction of the machine. They sometimes seem to turn in the wrong direction. Contrary to what our modern machinery is usually trying to make us believe, this machine seems to function anything but flawlessly.